Lin Rong used surgery to defeat a Japanese fingerprint scanner like this one. When people really want to enter a country, they’ll try anything. Chinese national Lin Rong, 27, reportedly paid surgeons 100,000 Yuan (~15,000 USD) to have the fingerprints from her left index finger and thumb swapped with those on her right hand. According to BBC News and the AFP, Rong was successful in entering Japan despite that country’s policy of fingerprinting all incoming foreigners. Later, she was arrested for the (unrelated?) crime of faking a marriage to a Japanese citizen. Upon arrest, officials noticed ‘unnatural scars’ on her fingers and eventually Rong confessed to her illegal entry. Originally deported in 2007 for over staying her visa (hence the elaborate means to enter Japan), it’s unclear if Rong will be removed again or sent to prison. While this is the first reported case of biometric fraud in Japan, experts worry that there are many more such incidents going unnoticed. 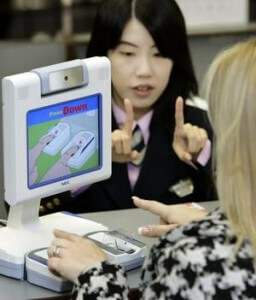 Japan’s fingerprinting procedures were put in place, in part, to help insure against unwanted entry by criminals. Yet Lin Rong’s defeat of the security check demonstrates that modern systems are far from flawless. One wonders if newer 3D fingerprinting would have been able to detect the fraud. Likely not, unless the system was programmed to notice unnatural scarring. Eventually, countries could employ new biometric methods for identifying individuals such as ear scans or even passive brain monitoring. Already gait and face recognition software is being used in some UK airports. Again though, I have to wonder if such techniques would have detected Lin Rong, whose face and walking pattern was unlikely to have been previously recorded. As governments move to increasingly sophisticated methods for monitoring and controlling human traffic they will have to find all the possible ways to defeat their systems. Or those looking to illegally enter a country certainly will.